Soil is more than something to walk on. It is more than an anchor for our plants and buildings. It is a vibrant environment, full of life, full of activity. It is a zone of intensive biological activity. It is not just worms, ants and plant roots that are housed in soil. Bacteria, fungi, arthropods are there in perfusion. A single spoonful of top soil contains hundreds of millions of tiny organisms. Soil starts with the breakdown of rocks or the accumulation of sediments. It continues developing inexorably via physical, chemical, and biological activity. It is slow, taking thousands of years to form and mature. The silts, sands and gravels of soil are fragments of the original parent material but the rest of the soil is highly modified. Clays are special types of minerals that develop slowly over time. Different clays develop reflecting the parent material, soil age, humidity and temperature. Clay has a strong influence on soil stability, fertility, water holding, drainage and aeration. Biological activity is stimulated by the growth of plants with their continual supply of organic matter into the soil system. The organic matter not only provides the energy flow into soil, but it is a major contributor to soil productivity and soil stability. Slicing carefully through soil we will find that less that half of its volume is solid. The rest is a complex arrangement of pores and channels. It is these pores and channels, which enable so much activity to occur. Water, air, nutrients and organic materials can all accumulate and be stored here, so that bacteria, fungus, and the tiny animals can grow and multiply. It is worthwhile to mention that the better the range of sizes, the condition and the stability of the soil pores, the more productive the soil. 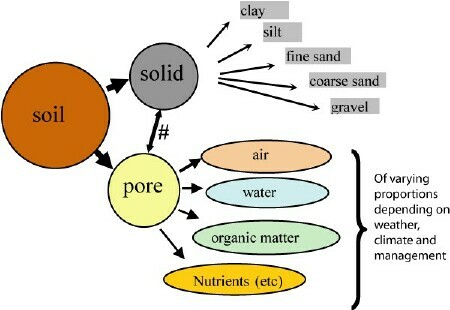 The composition and arrangement of all soils. Soil makes the earth habitable. being the interface between the atmosphere (air), the geosphere (rock), the hydrosphere (water) and the biosphere (organisms). being a fecund environment for the development and support of life by having a vast interconnecting matrix of pores, channels and surfaces for containing, air, water, nutrients and organic materials. housing the important life supporting cycles: the energy cycle, the hydrological cycle, the carbon cycle, the nitrogen cycle – in effect a self regulating biological factory. being the primary medium on earth for cleansing, storing and recycling. What are desirable characteristics for a soil? 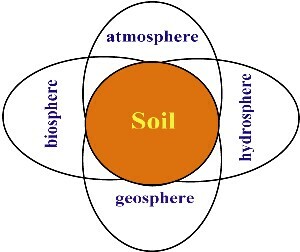 Soils vary from place to place. They are quite variable in form and in composition so it is not easy to list a set of ideal characteristics. Structure is relatively stable and able to support moderate levels of trampling and occasional disturbance without collapse.